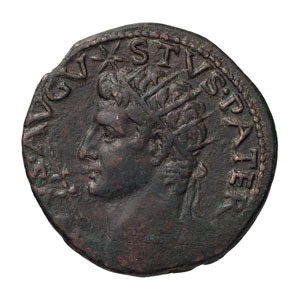 Divus Augustus. . As, 11.30gg. (1h). Rome, 15-16 AD. Obv: [DIV]VS AVGV - STVS PATER Head radiate left, star above forehead, thunderbolt before mouth. 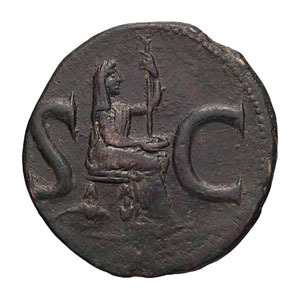 Rx: S - C to left and right of veiled Livia seated right, holding patera and scepter. BM 151. RIC 72 (C ). Paris 44. Cohen 244 (5 Fr.). Good VF.